So preserve making weekend is upon me and, as usual I am ridiculously unorganised. After a lazy morning of procrastination and flicking through hundreds of cookbooks and scribbled notes, I finally made it to Preston Market with a vague idea of what I would make. Elbowing my way through pushy Nonna’s and people ignoring the “do not choose cherries one by one” signs, I managed to pick up heaps of delicious in-season fruits for hardly anything! I’m talking $1 a kilo for pears and tomatoes and $2.50 a kilo for peaches! I even found cherries for only $8 and banana’s were a steal at $1.49 which is an absolute bargain since the QLD floods wiped out the banana plantations a few months back and bananas have been priced at about $15 a kilo for so long that it’s a rare treat to have one. I think I will make some banana bread. Anyway, laden with bags and my basket overflowing, I rode my produce home on my bicycle looking somewhat like a donkey or a crazy bag lady and now I am sitting here amongst piles of fresh fruit and cookbooks with a Cherry Blossom cocktail trying to decide which recipes I should make. Let’s hope I decide before I get too drunk! Shake ingredients vigorously with ice in a cocktail shaker and strain into a chilled cocktail glass. 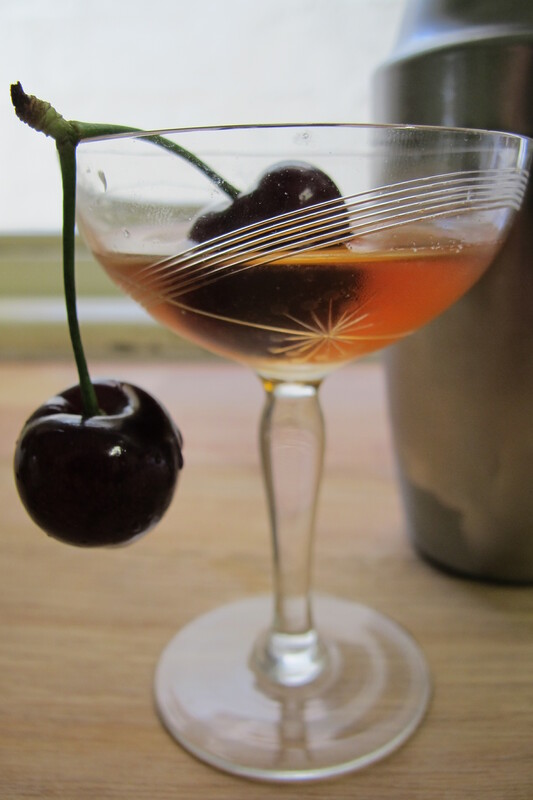 Serve with a cherry. Enjoy!